We were both so excited about finally reaching Goa. After the craziness of the last night in Delhi I particularly was looking forward to not having to worry about travelling for a while, and being looked after :D We arrived at Dabolim Airport at 5.30pm a tad ahead of schedule and were met by my cousin Ranicia at the baggage belt wearing a red sari (her Air India uniform). Shortly after we met my aunty Segu and uncle Alvaro and whizzed off to Mandur. Perfect timing as the sun was setting and it all looked beautiful :) When we arrived, Mai was waiting for us outside (think she'd been waiting out a while for us) and Brownie came out of the garage briefly to see then ran back inside. Guess he didn't remember me. Was really nice seeing Mai and the house after two years - nothing really had changed. Welcomed to Goa with beef curry and pulao, a hot shower and a comfy bed for first time in ages. Weren't sure what we were going to do over the next few weeks, but the planning could wait for another day. Margao. Thomas cook. Agnelo and bhagi puri. ELISA. Dinner. Car - three kings church, hotels then samosas at Menino Jesus. Then colva, ludin and home. Booked flights and called Halifax. Plan of the day was to head to Margao - the main town of Southern Goa, to sort out getting some US dollars to pay for our Africa tour. My aunt and uncle had an idea of where we could do it so we set out early. The first place couldn't quite understand why we needed post 2005 bills and told us to take the money out at the ATM and go to the main Thomas Cook Bureau de Change over the road. So loaded with the equivalent of $600 each in rupees we went to TC only to be told that we couldn't change the money today. Apparently Indian regulations now require 1. Proof of onward travel within the next 7 days and 2. ATM receipts to prove the money's yours. We had neither so they said we would only be able to exchange 10000 rupees ($200) worth each next week. Brilliant. Was so pissed off. If we couldn't get the money changed, how were we going to pay for the trip? Both of us were not in a great mood. Was so frustrating. Afterwards we met up with my uncle Agnelo and after a quick bhagi puri and lime soda, headed to my cousin Elissa's school to pick her up. Recognised her straight away. Very strange that she's the youngest in our family but is now 15 and my height already ( I know hardly difficult to be taller than me, but still). From there we headed to Utorda to Agnelo and Melicia's house. Melicia had had to have surgery last summer while we were Ecuador so was looking forward to see how she was doing since then. Looked like she was still in a lot of pain but getting better which was good news. After lunch (3rd meal of the day and it was only 2pm) we tried to book our flight back to Bombay, but again Halifax seemed to have blocked both our cards. Typical. Would have to wait until the evening to sort it all out. After a quick cup of tea, we headed out for a drive with uncle Agnelo. He took us to a chapel set on a hill in Cuvem, where we had gorgeous views all the was out to the coast. Was really beautiful. Then we headed down to the beaches around Utorda and Majorda, before reaching Colva where we had samosas and a sunset walk along the beach. Colva is the beach I remember most from when I was little, but was strange seeing the beach covered in beach shack restaurants. Price of tourism I guess. It was getting late by the time we reached home, but we were shepherded back out the door to visit Agnelo's brother's family who I last probably saw 20 years ago when I was flower girl at Melicia's wedding. Finally got to have a shower and contact Halifax at 10.30pm ready for dinner at 11pm! Wasn't at all hungry for the 5th meal of the day but they'd waited for us so wolfed some down. Weird day overall - was strange being told when to get up, what we were going to do over the next week without having much say, and being forced to eat and rush from place to place which we hadn't had to do for the past year. Was quite upset when mama called and then figured that it'd be good to have some proper time to see Goa by ourselves. Today was solely a touristy day. As I hadn't seen much of Northern Goa before, and Mike hadn't seen any of Goa yet really, we took a day tour starting in Panjim. The pick up bus pretty much drove us round and round Panjim several times for an hour before we actually crossed the bridge into one of the Northern states of Bardez for the start of the tour. Our first stop was Voco Beach where we boarded a boat for dolphin spotting. 300 rupees for 30 minutes. The rest of our group were all Indian tourists so the guide spoke solely in Hindi for them which wasn't great, but saw a couple of dolphins before the captain swiftly headed away from any that came close enough for a photo. From the boat we could see Fort Aguada perched on the cliffs. We were told we would be going there on the tour, but once back on shore the guide then said that wouldn't be possible. Mike had been looking forward to it and we were wondering what else we'd be able to see. Next up was a visit to Calangute Beach for a cheeky glass of Caju Fenni and Limca (local lo our made from Cashew fruit) in one of the many beach shacks. Was really surprised to see so many deck chairs and restaurants full with a lot of Russian tourists. Beach was a clean though which nice as the last time i was there was pretty grim. Next stop was lunch at a roadside restaurant near Anjuna - not the best food we'd had and was cold :( Really wanted some Goan curry but they only had North Indian dishes which is what we'd had plenty of in the past year. After lunch we went to Vagator Beach and climbed up the rocky hillside to an old fort ruins. The view was amazing - the coastline went on forever and was so quiet up there, could've stayed there a lot longer. Back on the bus we headed back to Panjim then onwards to Mandur. At home Segu's, Melicia and Melen had been busy making Sanas (a type of sweet rice cake with coconut) and other things for the Feast. I steadily helped eat A LOT of sanas. They were lush and something I hadn't had in years. Yum! After a quick shower, the neighbours came round to collect Our Lady for her next port of call. The drive to Palolem took only 45 mins. Was expecting it to be ages away as we'd never been before as it'd always been too far. The beach was stunning though. It looked like a bay with an island at the Northern end that you could walk across too at low tide, and the water was calm and looked very inviting. With Anderson's contacts, we stayed at his friend Brendan's Beach Huts for a bargain 500 rupees (£6.50) per night. The hut had a room with bed and bathroom and veranda. Perfect. A few cocktails were had on the beach and some papaya from Segu's garden on veranda. I was craving Chicken Xacuti - a type of Goan coconut curry, so we stayed at the restaurant attached to our huts for dinner and watched the sun go down over the Arabian Sea. Beautiful. The next few days at Palolem we spent just swimming, relaxing on the beach and in the hut. Lazy days getting up at midday to have breakfast, heading out for an evening meal then movie at Magic Trees - a bar showing movies outside under the palm trees. Pretty cool as you only needed to pay for a drink. We got to see Cloud Atlas ( a highly nonsensical movie which we missed only the first 10 minutes with no hope of recovery) and The Hobbit. While we were there we managed to celebrate our 5th Anniversary with lots of cocktails and really great food. We liked it so much we decided to stay another night in the end. Really didn't want to leave. Definitely will be going back again. We had a busy day and needed to meet my aunty Melen in Panjim so hopped onto a bus to Margao first. Turned into a bit of a 'mare as the bus conductor kept us on his bus despite it not going to Margao at all. We ended up having to change at Quepem then onwards to Margao. We were less than a week before we were due to leave so we went back to Thomas Cook to change money, but this time they said we could only change 10000 rupees each ($180). So frustrating as we still couldn't get it all sorted. Anyways, we needed to meet Melen in Panjim so hopped on the bus and Visit Rolland's flat. Huge. Go to Candolim - lunch then strawberries and pancakes (with jaggery and coconut). Fort aguada, dona paula (looked like ports in England) for sunset. Briefly went to food carnival. Miranar for Bhel Puri, Shev Puri and Pani Puri. All lush. Back over ferry to candolim. Hair dryer and conditioner - normality! Early bus to Panjim then express bus to Margao to meet uncle Xavier's girlfriend Victoria and her daughter Criselle. Another chance to change money at Western Union. No problems at all today! Didnt ask for flight tickets either. Brilliant! 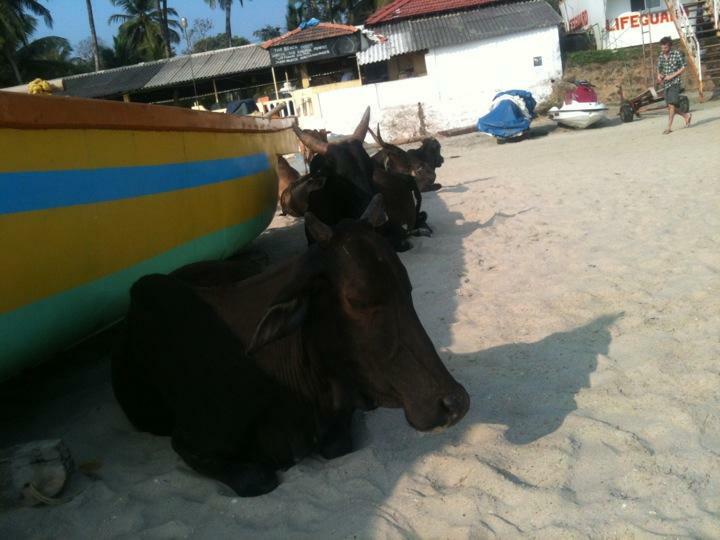 Jumped in a taxi to the beach at Sernabatim (near Colva). Passing Mungul on the way. Had some food at Furtado's before heading into the sea. As i'd for the first time in ages got my hair to actually look nice, I had decided not to get in the water. After dipping my toes in though we both decided to get in. The water being so warm, it was lovely. Difficult to swim though because of the big waves, but still nice getting out of the sun. We managed to build a sand fortress on the beach after - castle by Mike, whilst moat, dragon and snake defences by leece. Mike got very sunburnt after the fortifications were completed :S Quick lunch then off to the shops to see if we could get some last minute bargains. Victoria got me a lovely silver anklet with bells on. Could hear me coming from a mile off! Also found some lovely silk cushions which Mike has tried hard to veto. We called Anderson to come pick us up. We all thought he was bringing the car, but instead he and Ruistan had come on their motorbikes! Didn't know what to do as Victoria and Criselle needed dripping off in Margao. So, me and Mike jumped on the back of Ruistan's bike, and Anderson took the others. Was hilarious though a tad nervous zooming at speed through the heaving Margao traffic. Quick shower and tea at Segu's then off to Betalbatim beach for the carnival party with Anderson, Ruistan and his friends. The stage was huge but not too crowded and the music was pretty good. Mostly drum n bass/ dance (wop wop) Had a really good time. Not been out clubbing in ages so was a nice change. Finished at 1pm (much to everyone's disappointment) but after our day, was cream crackered and defs ready for bed. A feeling we hadn't had for ages - a massive hangover. Eurgh! Up at 10 for breakfast then out for a Carnival waterfight with the neighbours. Apparantly its tradition, and Anderson and Ruistan thoroughly got into the party spirit agsin, even getting out the soap to gove their cousin's a proper wash. Me and Mike got it too (and water all over the house!) mucho fun. A mammoth lunch then a quick rest before heading our to Margap to watch the carnival floats. We were supposed to to head back to Mandur to apend our last noght with Mai, but as we disnt have much time and Segu's house is an hour away, we decided to stay and watch the floats properly. The whole of Margao centre was cordoned off, strung up with carnival masks and streamers, and the pavements were packed. The carnival was opened with the cheer leaders dancing to Gangnam Style, followed by the procession of floats including one with some guys with their bums hanging out dancing! Craziness. Back home to rest up for the day after. Finally dawned on me we were leaving - always sad saying goodbye to lovely Goa. Early start as we still needed to visit a few places before going back to Mai's to pack our stuff. We stopped off at Pilar to see Father Agnelo's shrine at the church, then headed to Old Goa to see St Francis Xavier's tomb in Basilica Bom Jesu then back home to pack. Melen and Melicia were both home when we arrived to see is off. One last call from Ma - was snowing at home and she was walking to work. Was probably the last time we'd be able to talk until the end of our Africa tour :( as our flight wasn't until 8.30pm we left Mandur and Mai around 4pm. Was sad to leave her and Brownie. Wished we'd had more time with her :( Before we left we got a text from Indigo to say our flight was slightly delayed. Turned out to be 2 hours late on the end! Ranicia was working that day, so after saying bye to Alvaro and Segu's, we visited her at the desk, then waited for our flight to Bombay. Once in Bombay we were worried we might miss our flight to Nairobi as we were now cutting it fine. At check-in we were told we couldn't take ANY rupees out of India, so we'd have to change all our foreign money here. The rate was awful but we hot a few extra dollars, then queued for ages at immigration before being able to go to the gate. Quick 2am KFC then off we went to start our African Adventure!! !